The links on the left side of the page lead to complete profiles with histories, images and wine tasting notes for many of the best wineries located in California. It can easily be argued that California wine comes from the most interesting soils and terroirs for wine lovers, wine makers and wine growers alike. Those soils and terroir have propelled the popularity of California wine so much that close to 90% of all wine in America comes from California. This is a good thing for the residents of California who consume close to 20% of the annual production from their home state. While Napa Valley is the most famous wine producing region in America, as far as the amount of wine coming out of the valley, only 4% of all California wine comes from Napa. As you can see, this is really a treasured region. California wine producers offers more diversity of not only styles of wine, but the grapes that are planted in the Golden State. All the noble varieties are planted: Cabernet Sauvignon, Merlot, Syrah, Pinot Noir, Chardonnay, Sauvignon Blanc, Semillon and Riesling. But the list of noble grapes doesn’t even begin to describe the wide variety of vines planted in California. Zinfandel, Petite Sirah, Grenache, Mourvedre, Malbec, Cabernet Franc, Roussanne, Marsanne, Nebbiolo, Sangiovese are also cultivated in vineyards across California as well. California also lends itself to make sweet wine from grapes attacked by botrytis, sparkling wines in a Champagne style, or even fortified wines. While the grape plantings in Northern California are dominated by red wine grapes, especially Cabernet Sauvignon, there is still quite a bit of variety. For example in Napa Valley today, you can roughly consider that Cabernet Sauvignon is planted to 20,000 acres, Merlot sees 5,000 acres, Pinot Noir has 3,000 acres of vines, there are 1,500 acres of Zinfandel and you find about 1,000 acres of Cabernet Franc. For the white wine varietals, Chardonnay leads the way with 7,000 acres, followed by Sauvignon Blanc with 3,000 acres of vines. From there you find varying amounts of different red and white wine grape varieties planted. This is just in the Napa Valley. Other parts of the Golden State can also have quite different plantings that vary from the same grapes in different percentages, to various, lesser known varietals. At the exterior of the Napa Valley region, you are in what is often referred to as the bench land. Here, you find more gravel, along with alluvial soils which provides naturally good drainage. This is perfect for Cabernet Sauvignon. You have the slopes, hillsides and mountain vineyards which are the home of volcanic soils, red and white clay as well as sandstone. The soils are not as deep as you find on the benchland, but they are complex, often providing unique, micro-climates. Due to the cooler temperatures, you get lower yields, more tannic, fresher, concentrated wines that are usually the last area to complete harvesting. The valley floor, which consists of a myriad of various rock strewn sites and clay soils. Vineyards on the valley floor have the ability to withstand, the hot, dry summers. This is going to become more important in the years to come as water becomes more scarce.Due to the divergent array of soils and climates, as well as choices made by wine makers, wine lovers have numerous choices in the style of wines they can drink as well. California, unlike Europe is more often than not, going to enjoy good weather conditions, with enough warmth, sunshine and rain to allow the grapes to ripen. Plus, when nature comes up short, it’s legal for growers to irrigate, when the water levels were too low. That means that most of the time, growers are going to be able to make good wine. That is not the case with Europe. Back to wine styles for a moment, consumers can easily obtain wines in the ripe, rich, fruit forward, sweet style, if that’s what they seek. They also have the ability to purchase less ripe, dryer, more traditional styled wines, and some wineries are able to produce a wine that straddles the middle ground between ripe and traditional. The shortcomings from California wine comes from high prices for most quality wine charge. Plus, where California wine has the hardest time, is with low priced value wines. I am not sure why it’s so easy for vintners in most countries to make quality wines at value levels, but in California, that does not happen all that much. The first vines were planted in California as far back as the late 1700’s. But those were for religious purposes. The commercial birth of the wine industry took hold in the late 1800’s. Thanks to a small group of European emigrants, Napa and Sonoma got their start when Abraham Lincoln was President! Credit for planting the first vines in Napa goes to George Calvert Yount, who began planting vineyards as far back as 1836. The famous town of Yountville carries his name. While Yount was the first person to plant vines, John Patchett gets credit for creating the first official vineyard and winery in Napa back in 1854. This was followed by in 1857 with Buena Vista, Gundlach Bundschu in 1858, Charles Krug in Napa 1861, Schramsberg in 1862, Hamilton Walker Crabb in 1868, Beringer in 1875, Inglenook in 1879, Montelena and Ridge date back to 1882. By this time, the news had spread about the perfect climate, great soil and cheap vineyard land. By 1889, almost 200 wineries were producing wine in California! Today, Chardonnay is the most popular grape planted in California, with close to 95,000 planted acres. Cabernet Sauvignon is a distant second with almost 80,000 acres planted. Merlot and white Zinfandel also enjoy immense popularity. Red wine continues to be the dominant shade of wine produced in California. In total, more than 525,000 acres are planted for wine grapes in California today in about 110 different, unique AVA’s, American Viticultural Areas. An AVA is similar to an AOC in that it is considered to be a unique and specific area for distinct wine growing grapes with its own soils, microclimate and terroir, leading to a specific style of wine that is only produced in that area. These different AVA’s exist in a myriad of different elevations from the foothills in San Diego all the way up to more than 4,400 feet above sea level in the Shadow Mountain AVA. California wineries continue to increase the number of acres farmed using organic, biodynamic and sustainable farming techniques. Close to 25% of all vineyards in California are farmed using organic, biodynamic or sustainable vineyard practices. While it is legal, and due to increasing water shortages necessary to irrigate, there are several producers that also dry farm, allowing the vintage to express its character on a year by year basis. Today, over 2,000 different wineries are producing wine in California. With numerous single vineyard wines and different varieties, believe it or not, this means that their are now more than 60,000 different wines being produced in California! California wine remains the most popular wine region for Americans. Close to 65% of all wine consumed in the United States are from California. The wine from the Napa Valley, especially those that are Cabernet Sauvignon based continues to be the most popular, sought after and expensive wine from the Golden State. The first part of modern era for California wine began shorty after prohibition, following the conclusion of World War 2 when the Mondavi family bought the Charles Krug winery. The Mondavi family sought to make wine that equaled the best wine from Europe and began using some of the modern techniques that were in place in areas like Bordeaux. Previously, the first grapes planted were often of unknown origin. Many vineyards were field blends at the time, planted with a diverse array of grapes, some of which were known and others that were not know. The Mondavi’s began planting Bordeaux varieties, like Cabernet Sauvignon and Merlot with great success. The next great event in the birth of the California wine region is the now famous, “Judgment of Paris,” when the best critics, writers and tasters assembled a blind tasting pitting California wines against their European counterparts. All the critics were surprised when they discovered more often than not, they preferred the wines of California. This was such a major story, reports of this were printed in every major newspaper, magazine and even newscasters discussed this with their viewers. California wine had arrived and they wanted everyone to know. The second half of the modern era for California wine dates to the accession of the famous and powerful wine critic, Robert Parker. His enthusiastic praise of the wines caught peoples attention. Robert Parker championed the growth of single vineyard wines, picking fruit when it had achieved phenolic ripeness, low yields and the use of new oak. He recommended growers look at what they were planting and where. Prior to Parker, numerous vineyards were planted to varieties that were commercially viable, but due to the soil or weather conditions, they were not able to make the best wine possible. That is not the case today. Most vintners understand what grapes are best suited to their specific terroir. Robert Parker excited people to buy and try the best California wine had to offer. Numerous small growers began making wine that was better than their better financed, and more famous neighbors. By 1994, the term Cult Wine took hold. A cult wine was defined as having a high Robert Parker rating, low production and most importantly, the wine sold on the after market for more money than the winery was charging. Soon, there might have been over 50 wines that were seen as part of the cult wine craze. By 1997, the cult wine phenomena began leveling off and less than a decade later, very few wines merit the cult wine title. Perhaps, Screaming Eagle, Harlan, Sine Qua Non and Marcassin are at the top of list today. As prices rose to meet demand, consumers were no longer able to profit from the sales of these very expensive wines selling for hundreds of dollars and the market began to decline. 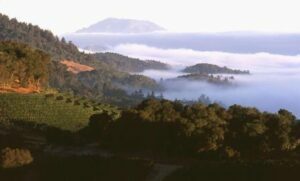 Robert Parker is seen by many people as the spark for the rise in quality in California wine. Others view him as the ruination of all that was great about California wine in the pre Parker days. Their comments go further claiming his preference for ripe, bold styles killed the traditionally styled wines of yesteryear. It’s their right to think California wine was better before Parker, but I do not agree. Nonsense is a better word. Some producers made great, age worthy wines of character before Robert Parker, but that is a short list. In the good old days, perhaps 10 – 15 producers made good wine. Today, hundreds of wine makers are producing great California wine. In February, 2011, Robert Parker stated he was no longer reviewing California wine. From that point forward, Antonio Galloni would be writing about wines from the golden state. Robert Parker Quits Reviewing California Wine! What Happens Now? While most California wine is sold in the United States of America, especially when it comes to the top producers of California wine, the world market continues to purchase more wine from the Golden State each year. 2017 marked the best year yet for California wine exports. Exports of all wine from America topped 50 million cases of wine worth more 1.62 Billion Dollars! Over 90% of those wines came from California. Demand is expected to continue, especially for the hard to get, premium wines from the Napa Valley. Does California wine age, evolve and improve? Clearly California wine ages. Provided we are talking about wines made from Bordeaux varietals, especially when the wine is dominated by the Cabernet Sauvignon grape. But does it improve? California wine ages on a very different curve than their European counterparts. The wines soften, the flavors and oak become better integrated, but in most cases, they seem to remain the same, but they lose their wonderful, delicious, exuberant qualities, which is why I like California wine in the first place. Of course, that is not always the case. You find tasting notes in The Wine Cellar Insider for California Cabernet Sauvignon based wines going back to the 1970’s, 1960’s and even the 1950’s, which show those wines provided sublime tasting experiences. But that is the exception and not the rule for the aging curve on California wine.